The arrival of information and communication technology in almost all sectors of the economy - such as smart grid, smart metering and industry 4.0 - increases the demand for mission-critical machine-to-machine communication. More and more, companies and organisations require communication that provides the excellent reliability and resilience found in Private (Professional) or Public Access Mobile Radio Networks. The Private (Professional) or Public Access Mobile Radio Networks (PMR/PAMR) market can be characterised by two different trends. On the one hand, 6.25/12.5/25 kHz services and technologies are still demanded and used extensively, on the other there is a trend towards PMR/PAMR systems using 200 kHz, 1.25 MHz, 1.4 MHz, 3 MHz and 5 MHz channels. This development has gained substantial momentum in recent years with expected deployment of millions of devices. It is linked to the introduction of information and communication technologies to several market sectors which request data oriented PMR/PAMR services. The developments of technologies ̶ to support more data, varying frequency bandwidths, and in business and mission-critical machine-to-machine (M2M) communications ̶ is important for users across industries. The evolution of market demands, the availability of cellular mobile technologies in 400 MHz bands, as well as evolving requirements for mission-critical M2M applications, should be carefully reflected in spectrum management activities and in national frequency policies. In consideration of the above, a number of studies have been recently completed within the Electronic Communications Committee (ECC). Their aim is to build a general framework and additional guidelines, which will assist CEPT national administrations in accommodating the growing needs within the 400 MHz spectrum for land mobile systems. Based on these studies, one new draft ECC Decision (19)02, two revised ECC Decisions (16)02 and (08)05, and one new ECC Report 292 concerning 400 MHz spectrum, prepared by the Working Group Frequency Management Project Team FM 54, have been in the public consultation process. They should be finalised in early 2019. ECC has been investigating a flexible harmonised approach for broadband-PPDR for several years. The current edition of ECC Decision (16)02 already has harmonised technical conditions with least restrictive technical conditions for PPDR broadband services at 450 MHz and 700 MHz. In the proposed revision of ECC Decision (16)02, the 410 – 430 MHz band is added as another possibility for broadband for PPDR services. CEPT administrations can introduce additional spectrum for BB-PPDR in parts of the 400 MHz range with least restrictive technical conditions channelling arrangements for 1.4, 3 or 5 MHz within the following paired frequency ranges: 450.5 – 456/460.5 – 466 MHz; 452 – 457.5/462 – 467.5 MHz; 410 – 415/420 – 425 MHz; 411 – 416/421 – 426 MHz; and 412 – 417/422 – 427 MHz. Under the developments, ECC proposed that the Third Generation Partnership Project (3GPP) should consider standardisation activities for Long Term Evolution (LTE)-based systems for 410 – 430 MHz spectrum. ECC Decision (08)05 identifies the frequency bands for digital PPDR narrowband and wideband radio applications in the 380 – 470 MHz band, using tuning ranges where necessary. Sufficient spectrum shall be made available for narrowband digital PPDR radio applications. This could be done by using channel bandwidths up to 25 kHz within the duplex bands 380 – 385/390 – 395 MHz and/or for wideband digital PPDR radio applications that use channel bandwidths up to 150 kHz within available parts of 380 – 470 MHz, preferably in 380 – 430 MHz. This Decision has been revised to include the aspect of free circulation and use of compliant PPDR-user equipment which operates under the control of a network. A similar provision is also included in the new draft ECC Decision (16)02. The new draft ECC Decision (19)02 covers land mobile systems in the following frequencies: 68 – 87.5, 146 – 174, 406.1 – 410, 410 – 430, 440 – 450 and 450-470 MHz. The Decision recognises land mobile systems use with different channel bandwidths, which vary from 6.25 kHz up to 5 MHz. It defines technical requirements, depending upon the frequency band and the channel bandwidth and provides further guidance, in particular for the coexistence between different systems. The technical requirements are described in a technology neutral way, while accommodating the introduction of a range of relevant technologies. These include: dPMR; DMR; TETRA; CDMA PAMR or LTE-based land mobile systems; M2M/internet of things (IoT) based on narrowband IoT (NB-IoT), and low-power WAN (LPWAN) technologies. This approach offers CEPT administrations the opportunity to decide which of the land mobile systems can be introduced in their national frequency allocation and use plan. The draft new Decision also exempts from individual licensing and allows the free circulation and use of terminals of land mobile systems operating under the control of a network. Broadband networks in Europe are already deployed in Austria, Czech Republic, Denmark, Finland, Germany, Hungary, Latvia, The Netherlands, Norway, Sweden and Russia. They provide connectivity for millions of devices using CDMA450 or LTE450 technology. These networks have been assigned nationwide licences, and it is assumed that existing CDMA networks are likely to migrate towards LTE including eMTC and NB-IoT. The new draft ECC Report 292 provides a good overview of the situation in Europe for the 400 MHz frequency ranges to be used by land mobile systems. The new Report includes guidance, fostering the increased shared-use of PMR channels, how administrations can amend their PMR/PAMR regulatory framework, and how they could achieve more contiguous band segments for wideband and broadband systems. The Report also recommends more flexible approaches for licensing and the adoption of a concept defining area licences, as already used in the United Kingdom. The draft ECC Report 292 also sets out the results of the PMR/PAMR survey which highlight that the use of the frequency bands between 400 MHz and 470 MHz varies significantly throughout the European countries. 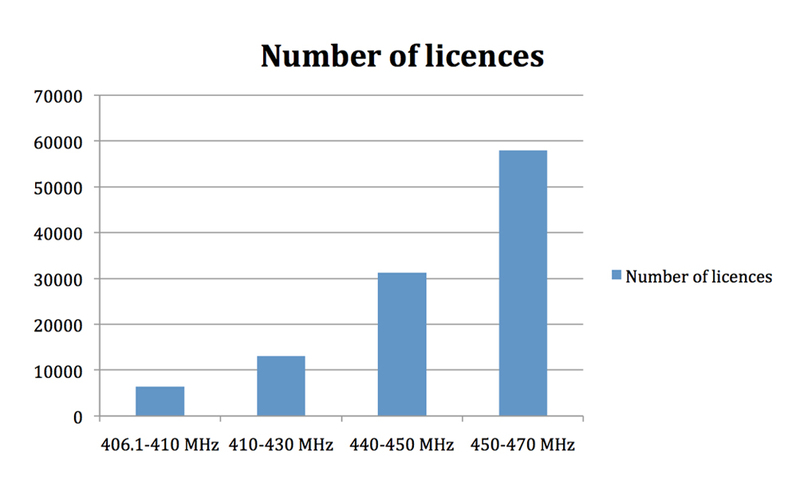 The total estimate in the CEPT is that about 120,000 PMR/PAMR licences are awarded with a channel bandwidth of up to 25 kHz, excluding most likely some governmental use or PPDR use that was not counted. Due to congestion situations - for example, in European capital cities or at border areas - the increased shared use of PMR frequencies and related methodologies such as ‘sharing number’ seem to represent a significant opportunity for serving more users in the existing spectrum for PMR. In this situation, it is important for spectrum regulators to apply a technology-neutral regulatory approach which maintains a balance among the different technologies without favouring one technology approach. The technical conditions set out in the new ECC Decision (19)02 are considered to provide the necessary guidance on this aspect. The ECC Working Group Frequency Management also updated the Recommendation T/R 25-08 on planning criteria and coordination of frequencies in the land mobile service in the range 29.7-470 MHz. A revision was published in September 2018. The revision includes new recommendations for the cross-border coordination of land mobile systems having different channel bandwidths on both sides of the border for the 400 MHz ranges. It should be noted that some aspects require further consideration and investigations are still ongoing within the ECC, for example on the intermodulation effect from broadband interferers into narrowband victims for which no conclusion could be reached during the drafting of ECC Report 283. 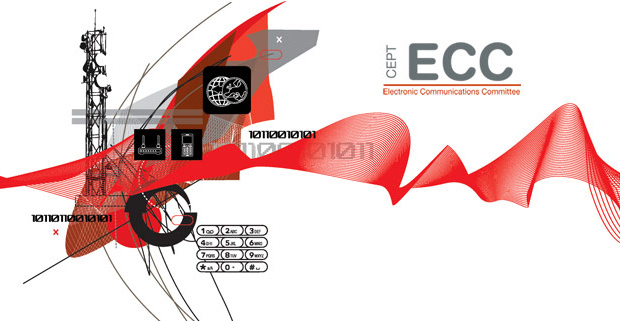 ECC is finalising the new regulatory framework for land mobile systems in the 400 MHz frequency ranges. This will provide harmonised technical conditions for various technologies, and will support possible technology moves and new network types - such as from CDMA to LTE or towards wide area data networks for M2M/IoT mission critical applications - while keeping the balance with the requirements for other PMR/PAMR radio applications. Why do machines need telephone numbers? Programme Making and Special Events in CEPT - What's on? WRC-12: a success for CEPT? The 700 MHz Band: battleground or ‘fait accompli’? Internet access, it’s all about speed, right?